There are two ways to reset behaviour points, one automatically and one manual. To automatically have behaviour points reset go to 'School Settings' from the 3 lines menu in the top right hand corner. 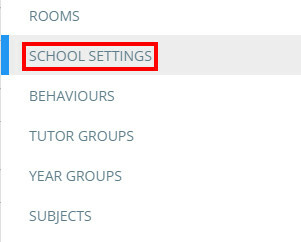 In 'School settings', select 'Behaviours' from the left hand side. Now scroll down the page to the 'Reset displayed behaviour points'. Here you can reset all behaviour points, reset all out of classroom behaviour points and set an automatic time to reset behaviour points displayed in class charts. To manually reset the behaviour points displayed in your class, go into class list view and find your class tile. Click on the 'Edit Class' button to bring up the class overview. From this view select 'Reset points'.